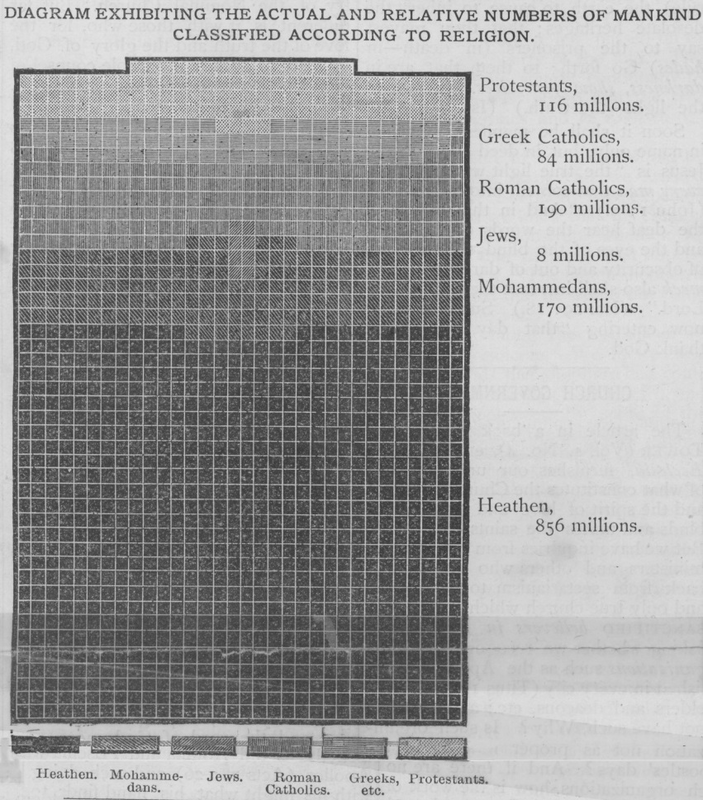 Each square of this diagram represents ten hundred thousand human beings. The lights, shades and blackness tell of the darkness and blindness which has overspread the earth, while sin and evil have ruled mankind, and cause us to look longingly for the bright Millennial Day when the Sun of Righteousness shall arise with healing in his wings, causing the knowledge of the Lord to fill the whole earth and to bless all mankind. If we hold „Orthodoxy” to its own creeds, it believes that all of these billions of humanity, ignorant of the only name under heaven by which we must be saved, are on the straight road to everlasting torment. And not only so, but all of those 116,000,000 Protestants, except the very few saints, are sure of the same fate. No wonder, then, that those who believe such awful things of Jehovah’s plans and purposes should be zealous in forwarding missionary enterprises—the wonder is that they are not frenzied by it. If we believed such things it would rob life of every pleasure and shroud in gloom every bright prospect of nature. But another peculiar thing is, that the „Mute Appeal” on behalf of Foreign Missions is issued by the WOMEN’S PRESBYTERIAN BOARD OF MISSIONS.” The peculiarity is that a denomination which in its creed declares its faith to be, that God did from all eternity predestinate some to knowledge and salvation, and all others to ignorance and damnation, should so disregard their „old landmarks” and prejudices as to attempt to change the arrangement which they declare was predestinated. But, really, we rejoice at this as an evidence that creeds of the darker centuries are losing their power over thinking people of every sect. We are glad, too, that their hearts are better than their creeds, and that they are superior to their estimate of God; for while they think that God looks calmly and unmoved upon this mass of humanity going down to hell at the rate of 100,000 a day, and never exercising His power to give them the needed knowledge, they are superior in that they are moved to pity and to benevolent action by the sight. The great difficulty with „Orthodoxy” is, that they fail to recognize plan and method in God’s word and dealings. Such will, perhaps, gather from our foregoing criticism, that we have no care for, nor interest in the heathen; but we can most heartily assure them that this is not the case. The reason why they would thus judge us, would be the same if they applied their judgment to the actions and teachings of Jesus. He went not to the Gentiles (heathen), and commanded the disciples likewise. (Matt. 10:5.) He did not cry aloud nor „lift up his voice in the streets,” shouting to and exhorting sinners or heathens to beware of eternal torture; neither did any of the apostles. revealed in God’s word all is clear, beautiful, reasonable and harmonious. How strange it does seem that these dear Christian brethren and sisters who issue the „MUTE APPEAL,” and others who seem so zealous and anxious for the salvation of men and the spread of the knowledge of the „only name” as a means to that end, should feel such an opposition to the teaching of the Apostles concerning the coming TIMES OF RESTITUTION of all things spoken by the mouth of all the holy prophets. Can they not see that God’s missionary enterprise is much grander and more comprehensive than theirs? Theirs, even if their prayers and desires were to be answered this very year, by the conversion of every living being on earth to the love and service of our Lord; this surely would not answer the cravings of sympathizing, loving hearts, and they would still pray: O, Lord, extend thy mercy and thy love to those in everlasting torment; and they would plead that those billions of the dead far outnumbered the millions of the living. How strange that they will not allow the Lord to tell them of HIS WAY of carrying on mission work, and how much comfort and peace they lose, and how many burdens they bear, because they have no ear to hear when He speaks through his word. God’s plan is to first select a „Royal Priesthood” during this age and have that priesthood teach and rule and bless the world in the next age. Now we are just at the threshold of the age of glory. The midnight shadows of the diagram are just beginning to flee before the „Sun of Righteousness,” and the printing and scattering of millions of Bibles in the past 87 years is one means toward the great work. In a word, then, these dear friends stand at our side in hope of the spread of truth, the great difference being that they expect to do it in their present weak, humble, mortal condition; and we expect to be glorified and clothed upon with heavenly form and power, as a means to the desired end. One of the great stumbling blocks which hinders „Orthodoxy’s” reception of God’s grand missionary plan, of a special age in which the world (including those in their graves) will be taught and blessed by the knowledge and merit of the ransom, is their false idea of what constitutes DEATH. They have accepted Satan’s first lie, „Thou shalt not surely die,” instead of God’s statement that men do die; hence they do all in their power to convince themselves that Satan was the truth-teller, and will not believe that when men die they lose life. They will not believe the Scriptural testimony. (Rom. 6:23; Eccl. 9:10; Psa. 6:5; Job 14: specially vs. 1,10 and 21; 2 Tim. 4:8.) Hence they are forced by their adherence to Satan’s theory, to claim that when men die they go to a place of woe or happiness and continue really to live, though they admit they seemed to die. Soon it shall be manifested that not in name only, but in deed and in truth, Jesus is „the true light which lighteth every man that cometh into the world.” (John 1:9.) „And in that day shall the deaf hear the words of the Book, and the eyes of the blind shall see out of obscurity and out of darkness. The meek also shall increase their joy in the Lord.” (Isa. 29:18.) Surely we are now entering „that day,” and for it thank God.